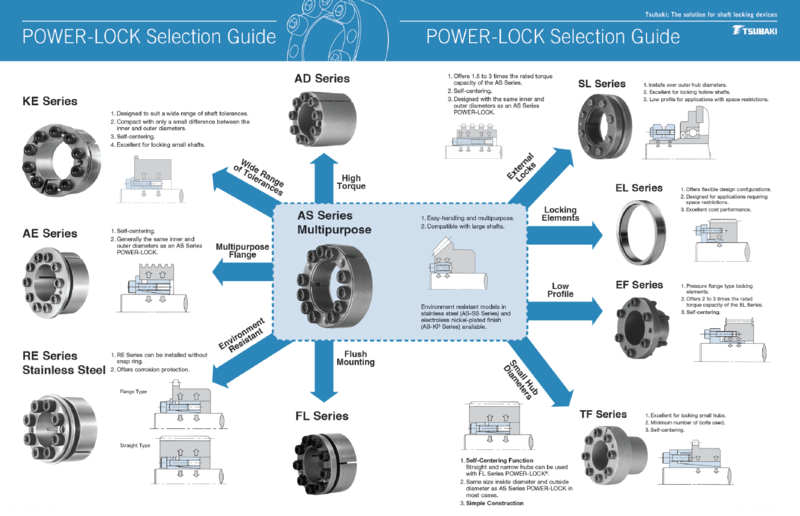 Tsubaki Power-Locks are well engineered, adjustable and affordable locking devices that solves many common engineering and maintenance issues associated with other connection devices, particularly keyed connections. The process of machining a keyway into a shaft is tedious, expensive and permanent. Most importantly, it reduces the strength and amount of torque a given shaft size can transmit. In addition, in a keyed connection, clearances must exist between the component hub, shaft, keyway and key, which allows for metal-to-metal contact, resulting in fretting and corrosion. Tsubaki Power-Locks help to eliminate these issues. The frictional, keyless system allows for easy attachment of shaft to hub without time and money spent on machining or extra assembly labour. It provides a solid connection between the hub and the shaft by using a keyless mechanical interference fit to transmit a high torque or withstand axial thrust and accommodates reversing, dynamic or shock loading. In addition, it features a precision-made, double-taper design that can be easily mounted on any rotational component, allowing the hub to be positioned more accurately on the shaft, and facilitating angular timing of the hub.